Former NASA astronaut Leroy Chiao, a "Star Trek" fan, floats with a Russian spacesuit on the International Space Station during his Expedition 10 mission in 2005. Leroy Chiao is the CEO and co-founder of OneOrbit LLC, a motivational, training and education company. He served as a NASA astronaut from 1990 to 2005 and flew four missions into space aboard three space shuttles and once as the co-pilot of a Russian Soyuz spacecraft to the International Space Station. On that flight, he served as the commander of Expedition 10, a 6.5-month mission. 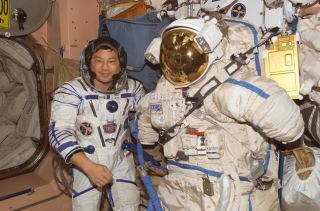 Chiao has performed six spacewalks, in both U.S. and Russian spacesuits, and has logged a total of 229 days in space. Chiao contributed this article to Space.com's Expert Voices: Op-Ed & Insights. Who from my generation could forget the original "Star Trek" series on TV? Fan or not, who now is not aware of "Trekkies" going from convention to convention, dressed in full-blown costumes as Starfleet officers, Vulcans, Klingons, Romulans and others? The original series ran for only three seasons, but endures and continues to make an impact. The ideas and shows were very creative, and touched on many themes that are still relevant today, including provocative ones such as issues with race and discrimination. The cast of the original "Star Trek" television series poses with NASA's space shuttle Enterprise in 1976 during the prototype shuttle's rollout in Palmdale, California. From left to right are: NASA Administrator Dr. James D. Fletcher; DeForest Kelley, who portrayed Dr. "Bones" McCoy on the series; George Takei (Mr. Sulu); James Doohan (Chief Engineer Montgomery "Scotty" Scott); Nichelle Nichols (Lt. Uhura); Leonard Nimoy (Mr. Spock); series creator Gene Roddenberry; U.S. Rep. Don Fuqua (D.-Fla.); and Walter Koenig (Ensign Pavel Chekov). While we don't yet have the medical tricorder, some technologies are getting closer. And I'm still waiting for someone to develop warp engines, transporter and tractor beams, and phasers. During the time of the VHS recorder, I was able to record most of the episodes on late-night TV reruns. They are still around somewhere, and I actually still have a functional player. Back then, I used to watch my favorite episodes over and over. My wife recently signed the family up for Netflix, which is much easier, and I have begun to watch the original series again. Former NASA astronaut Leroy Chiao watches a water bubble float in weightlessness on the International Space Station, where he served as both Expedition 10 commander and science officer in 2005. Maybe it's simple nostalgia, but to me, they seem even better now. You can read more of Chiao's Expert Voices Op-Eds and film reviews on his Space.com landing page. Follow us @Spacedotcom, Facebook and Google+. Original article on Space.com.